cardiovascular/pulmonary network: "cardio" refers to the heart, "vascular"
other elements needed for your cells and tissues to function properly. are the physicians who specialize in the lungs. have a heart condition caused by lupus. tissue, which can interfere with the heart’s ability to pump blood. other muscles in the body. 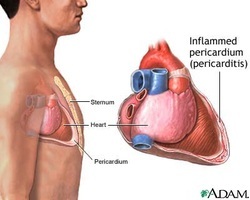 you are at increased risk for this type of myocarditis. enough blood to the different tissues and organs. plaque breaks off -- you could be at risk for a heart attack. and eyes and is a serious condition. that work by suppressing your immune system. bleeding usually does not occur. vessels and prevent the blood from circulating, a condition called thrombosis. called an embolus or embolism. lodge in the placenta and disrupt nutrition to the fetus. the blood vessels within the lungs, and the diaphragm. virus, or fungi is the most common cause of pneumonitis. chest pain, and difficulty breathing during physical activity. antibodies, vascular damage, and/or an inactive lifestyle.